Powers/Abilities: Professionally employed as a chemist, Hoyt accidentally created a chemical for restoring hair and curing baldness. 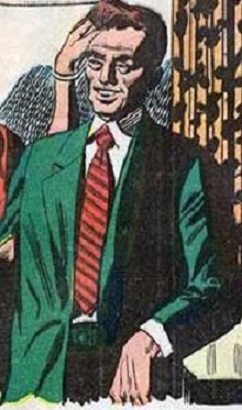 Consisting of an aniline dye mixed with a residue antibiotic and nuclear sludge wastage (taken from the reactors at his place of employment), the chemical was applied topically and worked on both humans and animals; it fully restored the hair on Hoyt's bald head in an unspecified period of time (see comments). Hoyt later discovered that the chemical had the side-effect of endowing him with the psychic ability to "overhear" other people's thoughts (telepathy)--it is unknown if this side-effect was temporary or permanent. This power seemed to function only "one-way," and he did not demonstrate the ability to project his own thoughts into others' minds. A good-hearted man, Hoyt was hoping to start his own business to market the cure. But Harry was a bit naive and too trusting of strangers, and he almost formed a business partnership with an unscrupulous individual, which could have cost him his life if not for his new-found power giving him a telepathic warning. 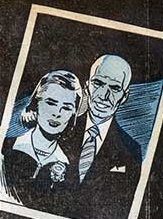 History: (World of Suspense#5/6 (fb) - BTS) - The past of Harry Hoyt is largely unrevealed, but at some point in time, he married Nan--he had a full head of hair back then, but he eventually went bald. He was employed as a chemist at the Carson Chemical Company. In his spare time, he worked on personal experiments in his basement lab at home. While trying to find a cure for fungus on animals, Hoyt tested a chemical mixture on a guinea pig whose hair follicles were destroyed by fungus. After a few applications of the chemical, the animal's hair cells were renewed with vitality, and its hair grew back abundantly. Hoyt then tried the concoction on his own bald head, and his hair was restored as well--unknown to him at the time, the cure would later produce an unexpected side-effect in him. (World of Suspense#5/6) - Hoyt surprised Nan and showed her his new head of hair, and she was quite pleased as she ran her fingers through it. He told Nan about his chemical discovery, and said he wanted to start his own business to produce and sell his baldness cure. Hoyt wanted to get a partner to take care of the business end of operations, while he would oversee production, so he put a classified ad in the newspaper to find a potential investor. Earle Bolton responded to Harry's ad, and he came to the Hoyts' house--although Nan cautioned him, Harry thought Bolton looked liked a trustworthy man, so he took Bolton down to his lab and showed him the guinea pig he used to test the cure. Bolton asked if he was sure the chemical would work on humans, and Hoyt told him it had worked on himself; as proof, Harry showed Bolton a photograph that had been taken a few weeks earlier, wherein he had been completely bald at the time. Now convinced that the baldness cure worked, Bolton gave Hoyt the partnership contract to sign and requested to see the notes on the chemical formula. 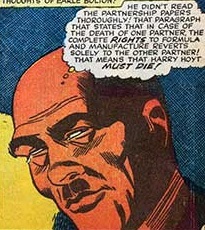 But after Hoyt signed the contract, he suddenly learned of the cure's side-effects when he began to "overhear" Bolton's evil thoughts--the contract stated that in the event of the death of one partner, the complete rights to the formula and its manufacture would revert solely to the surviving partner, and Bolton was plotting to kill Hoyt. While Hoyt stood with his back towards Bolton, Bolton sneaked up from behind with a work-stool, planning to strike Hoyt on the head--he would say that Hoyt fell and hit his head on the stool, and since they were alone, there were no witnesses to say differently. But at that point, Hoyt realized he was in danger and he lunged aside before Bolton could strike a fatal blow. Caught off balance, Bolton slipped and struck his own head on a counter-top. Nan overheard the commotion and ran downstairs, and Hoyt told her to call the police while he gathered his notes on the formula, so he could burn them. As Harry and Nan watched the notes burn in their fireplace, he told her that they'd always been happy, so why change that now? Besides, the potential fortune the formula could bring would only bring out the evil in men (and he was also probably considering the consequences of having more mind-readers in the world), so he would forget about starting his own business and be content to return to his regular job. Comments: Created by an unidentified writer and George Roussos (artist). When Harry showed Nan his regrown hair, it wasn't mentioned how fast the cure worked--unless Nan had been out of town and she hadn't seen him in some time, I assume his hair grew back fairly quickly. 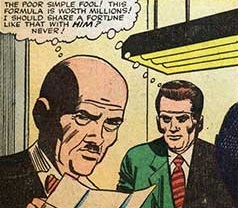 Hmm...Harry's "Super-Rogaine" regrows hair and stimulates psychic powers--Charles Xavier might be interested in it. In regards to Earle Bolton: I guess you should never trust a guy with a funny little mustache (As I'm sure Peter Parker (in the case of J. Jonah Jameson) would attest) (...and I'm not even gonna mention Schickelgruber). 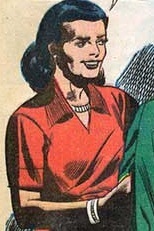 Nan was the wife of chemist Harry Hoyt. She learned of her husband's chemical cure for baldness when she saw Harry's restored hair, and she commented that he had a fine head of hair, just like when they were married. Harry told her he wanted to start a business to market his baldness cure and make a fortune, but Nan pointed out that they had no money to invest in its production. Harry mentioned he'd get a business partner who would put up the money and take care of the business end of operations, but Nan was concerned because she thought her husband was a kind and simple man who might get an untrustworthy partner. When Harry's potential business partner Earle Bolton came to their home, the trusting Harry thought he looked like a decent man, but Nan was still a bit apprehensive about him ("A book can't be told by its cover, Harry!"). 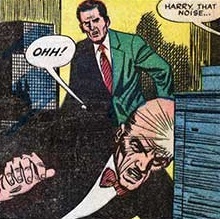 Bolton later tried to kill Harry and claim full-ownership of the baldness cure, but Harry saved himself because he had telepathically "overheard" Bolton's thoughts (as a result of his chemical cure). Nan heard the commotion and ran downstairs to find Harry still alive, while Bolton had slipped and struck his own head on a counter-top. Harry told her to call the police while he gathered the notes on the cure's formula, so he could destroy it. Later, Nan watched as Harry burned the notes in their fireplace, and he told her the formula might bring out the evil in men, so he would be content to just return to his job. Bolton was an unscrupulous con-man. He responded to Harry Hoyt's classified ad for a business partner, to help Hoyt market his cure for baldness. Bolton went to Hoyt's home, and when he was presented with proof that the cure worked on Hoyt, he realized the chemical could be worth a fortune, so Bolton gave Hoyt a partnership contract to sign. But Bolton had slyly stipulated in the contract that in the event of the death of one of the partners, the ownership and all rights to the cure would go solely to the surviving partner, and Bolton intended to make arrangements for Hoyt's "accidental" death. As Bolton sneaked up behind Hoyt, preparing to strike him on the head with a work-stool, he didn't know that Hoyt had "overheard" his thoughts (due to a side-effect of the chemical cure). With his telepathic power giving him foreknowledge of Bolton's intended assault, Hoyt avoided being hit. Bolton then slipped and struck his own head on a counter-top--it is unknown if this was fatal, or if Bolton was only rendered unconscious.